Raising a family costs a lot of money, but a family minivan to carry the kids doesn’t have to. If you live in Maryland near Mechanicsville or Prince Frederick, you can get a great deal on a used or certified pre-owned Sienna at Toyota of Southern Maryland in Lexington Park. 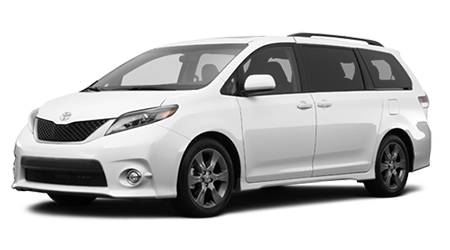 Sienna comes standard with a smooth and muscular V6 motor, and can set up to 8 passengers in typical quiet Toyota comfort. Come by today and browse our inventory with all the popular colors and options. For all the features and quality of a new Sienna at a lower price, you want a Certified Pre-Owned Sienna. Before even being considered for the CPO program, the van must have less than 85k miles and 7 years on it with a clean CARFAX report. Our factory techs then crawl over, under, inside and out doing a 160 point inspection and replacing anything that looks not up to spec. Toyota backs every CPO Sienna with 12 month/12k mile bumper to bumper coverage, with a deductible of just $50. An additional powertrain warranty covers CPO cars for 7 years/100k miles. Toyota offers Gold and Platinum extended plans with longer coverage of more parts too. Budgeting to pay for your new van is easy thanks to our finance department here at Toyota of Southern Maryland. You can apply and estimate monthly loan payments right on our website, before visiting our showroom. CPO Toyotas can sometimes even qualify for new car loan rates. No matter what you buy or what your credit score, Toyota of Southern Maryland can help put your family in a reliable, affordable used Sienna.